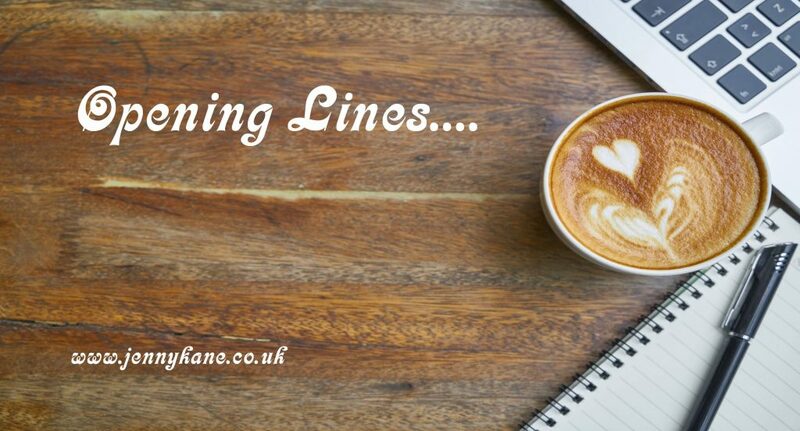 Welcome to my brand new ‘Opening Lines’ blog series. I’m delighted to welcome Jeannie Wycherley as my first guest of the series. Crone is my debut novel, set in and around Ottery St Mary and Sidmouth in Devon (the fictional Abbotts Cromleigh and Elbury of the novel). It’s a story that emanates very much from the landscape. The physicality of Aefre, whom we meet as she is being reborn in the opening lines, is actually drawn from the detritus of the forest floor. Birth and death are central to the novel, and in between those events some of the intriguing characters, such as the enigmatic Mr Kephisto (also known as the Story Keeper) live extremely long lives. 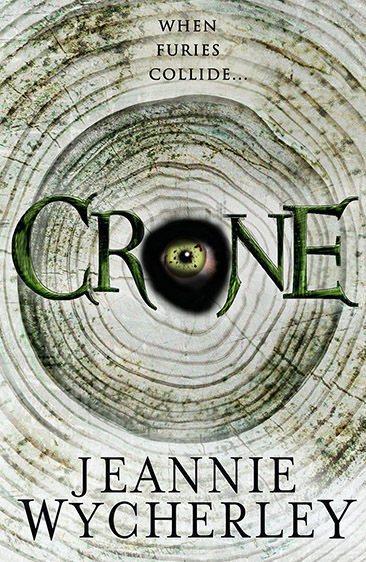 Crone is a dark fantasy novel, so as the author I was able to play with the longevity of each character’s existence, but at its heart it is actually a mystery with supernatural elements, and I have been contacted by many readers who start their email with the words, “This isn’t the sort of book I would normally read, but …” I am so thrilled that Crone has drawn such a diverse audience and appeals to such a cross section of readers. It was vitally important to me to maintain truth within the supernatural, so yes, you have to suspend some disbelief as you do in any fantasy novel, but all the magic involved, among the elderly Guardians who are hunting Aefre for example, is ultimately feasible. 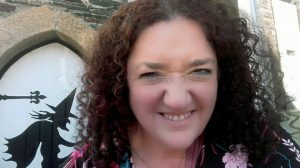 I wasn’t interested in writing about sparkly wizards, and glittery unicorns. This is witchcraft with dirty hands and broken nails. It’s about real human experience. But ultimately, it is the age old story of a mother’s love for her child. When Heather delves into a series of coincidental deaths, she is drawn reluctantly into the company of an odd group of elderly Guardians. Who are they, and what is their connection to the Great Oak? Why do they believe only Heather can put an end to centuries of horror? Who is the mysterious old woman in the forest and what is it that feeds her anger? When Heather determines the true cause of her son’s death, she is hell-bent on vengeance. Determined to halt the march of the Crone once and for all, hatred becomes Heather’s ultimate weapon. Furies collide in this twisted tale of murder, magic and salvation. The cracking and snapping of dry bones reverberated through the stillness of the night. In the freezing air, at the very heart of the wood, in the slumped ruins of a long-forgotten dwelling, something dark began to manifest itself. Little more than a mummified corpse, she unfolded her outer layer in a shower of dust and dry mould. Her skin, what remained of it, creaked like ancient leather and her flesh stretched taut over foul stringy innards. Then reaching, stretching, groaning, retching—she hauled herself upright. Once risen, she floated inches above the ground, while the mist—salty from the nearby sea—enveloped her like a pall and covered her foul nakedness. She slipped out of her shack, and the wildlife in the undergrowth shrank from her black charisma, keeping their distance from her rancid stench, the stink of putrefaction. In the treetops, caught out by her rapid manifestation, an owl blinked uneasily. Fearful, he observed her as she moved beneath him, then hopeful of evading her gaze he casually pivoted his head, pretended she was unseen and he was unseeing. But Aefre, even in her newly woken state, was both observant and deadly. She was fast, lashed out at the owl, a missile of energy directed from her mind. His body exploded in a cloud of downy feathers. Her deformed claw-like fingers caught his remains as he fell from his perch, and she stuffed him into her mouth, whole. She chewed once, twice. Swallowed. A single line of blood dribbled from her chin, and the thinnest layer of fresh skin started to form a mouldering translucent veneer. There was a halo of light to the east. Civilisation. For Aefre, the time was ripe. She was awake. It was time to bask in the thrill of the hunt. This time she would locate her sisters and join them in a merry dance of carnage. First things first, however. She needed sustenance. She headed for town. She would find everything she needed there. The boys tumbled out of the multiplex, blinking in the garish sodium lights of the car park, high on an adrenaline kick after enjoying the latest blockbuster. Max was grateful that James now had a driving licence and a car to go with it and they weren’t dependent on the non-existent bus service. It was hell being stuck in Abbotts Cromleigh with nothing to do. Max was completing his A levels this year, and come September he would be off to University in a city where you didn’t need a car. Everything he needed would be on his doorstep. Live music venues, sporting facilities: Sheffield promised to be everything his small Devon home town couldn’t be. 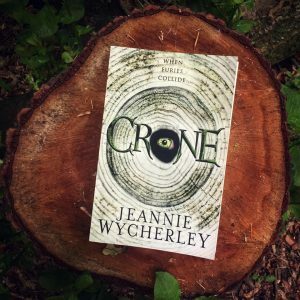 Jeannie Wycherley is the author of Crone (2017) and Deadly Encounters (2017) and numerous short stories that favour the weird including A Concerto for the Dead and Dying (2018). Crone is the recipient on an Indie B.R.A.G Medallion, and a Chill with a Book Readers’ Award. Jeannie’s next novel Beyond the Veil is due April 2018. Jeannie runs a gift shop with her husband in Sidmouth, adores her dogs, and make her evening meals in a cauldron. She lives somewhere between the forest and the sea in East Devon, England and draws literary inspiration from the landscape. Next week, Opening Lines, will feature contemporary fiction/romance writer, Nicola May. What an interesting piece and sampler. Wishing you lots of success. I am scratching my skin and looking around….